In the age of #MeToo, International Women’s Day takes on a special significance, too large to let pass without marking the event in some way or other. 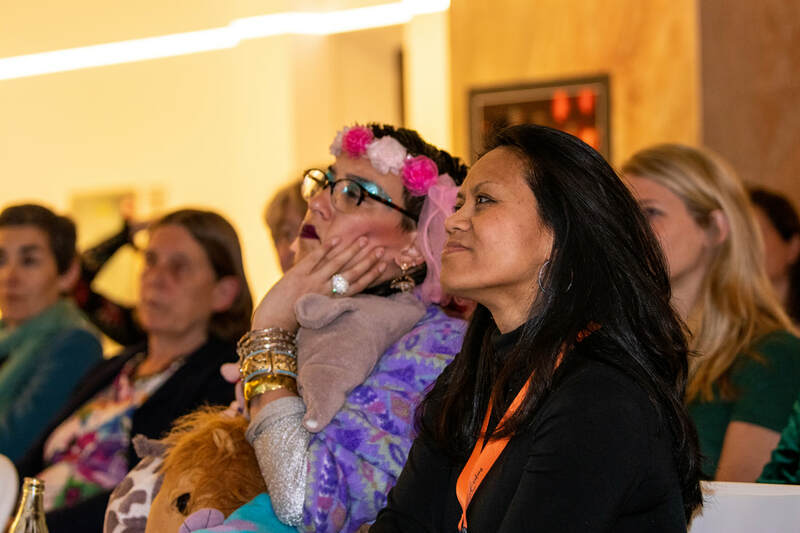 This year, FairFight decided to go big on celebrations; partnering with the Erasmus University College, we hosted a special event titled Women in Action in the lobby of the impressive EUC Blaak campus. The evening featured four very different speakers for a broad sweep of womanhood in today’s society. First up, Ginie Servant-Miklos, chair of the board of the FairFight Foundation, shared our work in empowering young girls from India and Zimbabwe through the practice of martial arts. Lijnie Reijers, a self-employed ortho-pedagogue, aikido master, D66 municipal candidate, mother and wife who travelled with us to Varanasi in January 2017, shared her personal story of struggle - from her experience of child labour and family trauma, to her successful career and life today. Following on, Sarah Hopkins, at the head of a London-City based recruitment agency, incited women to break the glass ceiling and advance their careers within proper support networks. Finally, Aynouk Tan, the Dutch media personality who brought us the NRC Handelsblad series on the impact of clothing on identity, discussed gender theory and the concept of gender as “doing” rather than “being”. The evening was structured around a feminist art gallery curated by Caterina Sardoni and Nico Skoularkis, both EUC alumni, organised in collaboration with the Rotterdam Arts and Science Lab. The gallery featured up-and-coming artists and students of EUC and the Willem de Koning Academy. Lumi Pulkkinen displayed photographs capturing the liminal space between trust and tension between linear narration and possibility. Marlene Biesendorfer prepared film loops and a lamp display that eerily reflected on women’s position in a consumerist society. Frederica Notari shared a poignant spoken word piece on biblical womanhood and her Italian heritage. Gwenn Le Pechoux conducted a live painting session in the exhibition hall, while Charlotte Schenk and Noa van den Boogaard had prepared a collection of IWD themed stickers. The exhibition also featured paintings and prints from Zimbabwean artist Tinashe Munemo, and British artist Katie Alexander, both of who also practice martial arts and work with the FairFight Foundation. Their artworks reflect the strength of the young vulnerable girls that the Foundation helps, depicting them as they grow through the practice of karate. 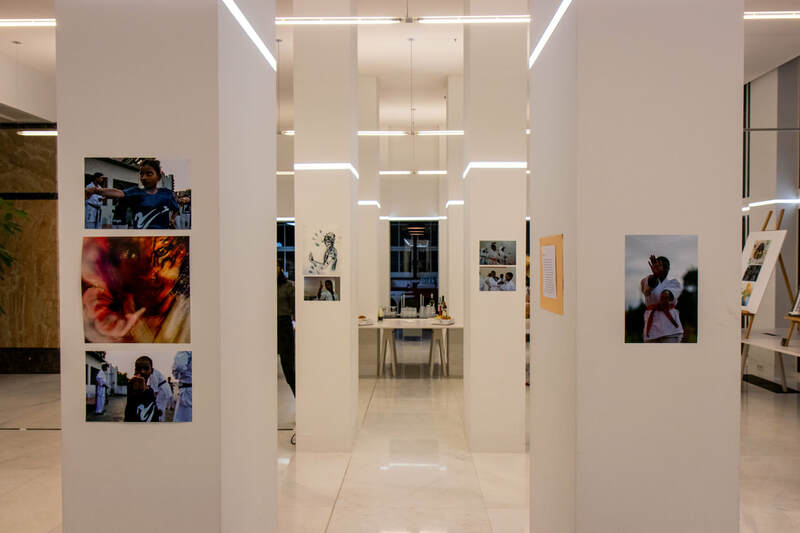 These artworks were juxtaposed with printed pictures taken by Myrthe Minnaert during her visits to the FairFight Zimbabwe and India projects. Providing atmosphere to the whole evening with songs themed around women’s power, RASL musicians Tim van Breemen, Evelyn Gallard, Gina de Boer and Jonas Nabbe played sets while guests wandered around the artworks, glass of wine in hand. With an attendance of around 80 people, including EUR faculty and students, community partners of the FairFight and the Zonta Club of Rotterdam (a local organisation dedicated to the cause of women), the evening was vibrant, interesting and definitely something to consider again for the next International Women’s Day. 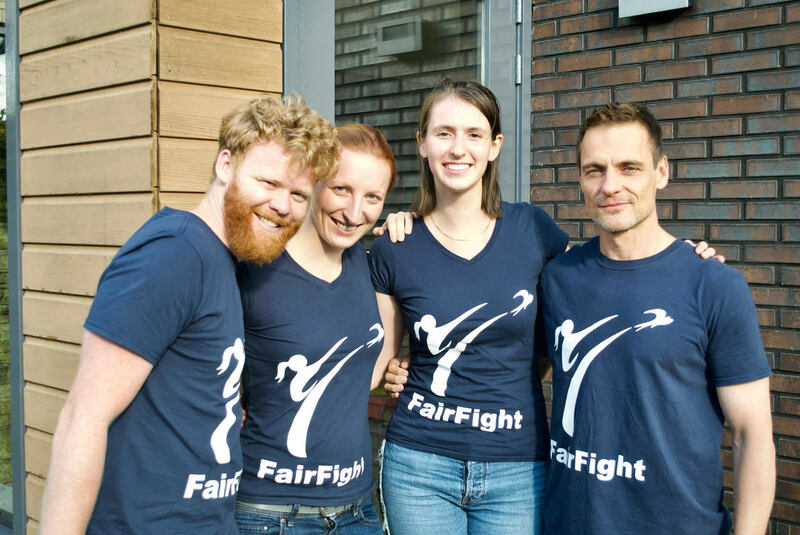 Following last year’s two impact visits to India, FairFight is preparing plans for 2019. This year we hope to expand the project into the community and enhance the instructor training programme with more visiting experts to work with the local team. The first visit will take place at the end of March. The main goals are to check in with the instructors on the ground, discuss outreach prospects and to secure venues and timetables for the seminar visits in October. ​Communication with the local instructors is significantly stronger when we have FairFight representatives visiting in person to see the situation first-hand, and so it is important to Mary as the India project manager to ensure that visits are frequent; this is why we wanted to commit to two visits this year, as the team did last year. During the visit in October, Mary discussed setting up a new club with Devesh, Amit, Pankaj and Sohan – she is particularly knowledgeable in this area as she runs her own club as her main line of work. She will therefore be checking in with progress in finding a venue and setting up classes, and seeing how we can support Devesh and the team in making this happen. We also learned from the last visit that the instructors want some new training equipment such as cones and protective sparring gear and so we will be taking the opportunity to provide them with as much as possible. 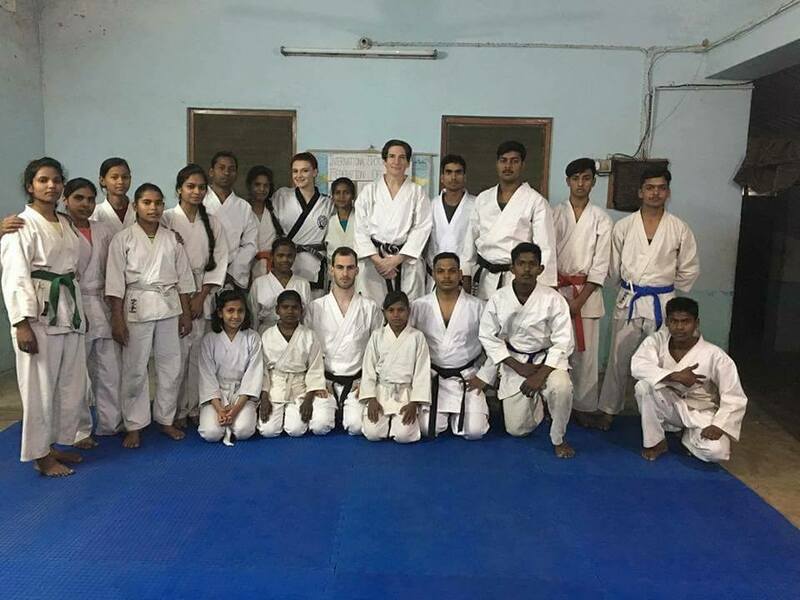 In October 2018, Guy Shpak ran a very successful krav maga-based self-defence workshop for the students of Disha House and the dojo in Sarnath. Mary has been discussing running a similar seminar in October of this year for the students of Banaras Hindu University, again with a particular focus on women’s self-defence, partially in response to growing concerns about the sexual assault statistics of Indian universities. Mary is also planning to set up a competition sparring seminar for the ISKF-UP students and instructors as this is a particular specialism of the club. 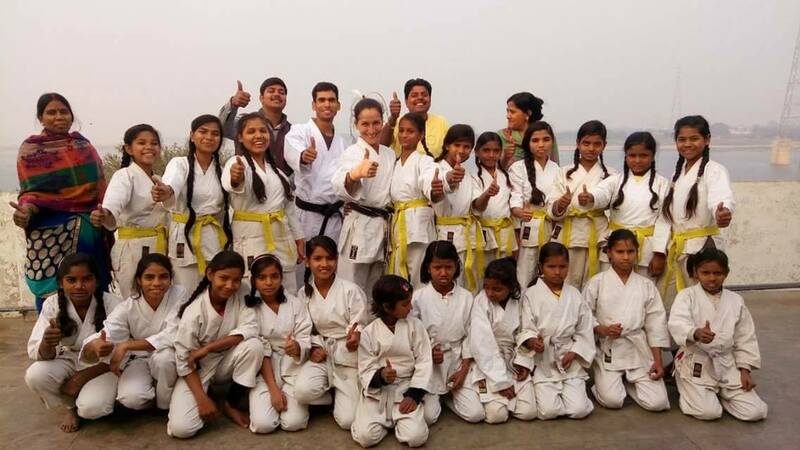 With their strong record in Indian national competition, some input on elite fighting techniques will benefit the club greatly and support their reputation both locally and nationally. Again, it is our hope that having two visits within the year will make it significantly easier to plan logistics and carry out such events. Charlie Stevens will be travelling out as well, predominantly to document the visit and to see the students of Disha House again. Having first met the girls in October 2018, Charlie feels it’s very important to return to Disha as soon as possible to reconnect with them and continue to show our ongoing commitment and attachment to them. She was originally selected for the team to be a role model, as another young, female martial artist, and so she is especially keen to show the girls that she’s graded to 1st Kyu since they last saw her and is now preparing for her Black Belt examination in July. Charlie will also be taking responsibility for social media and outreach once again. Keep an eye out for more updates on the project on Facebook (FairFight) and Instagram (@fairfightfoundation)! 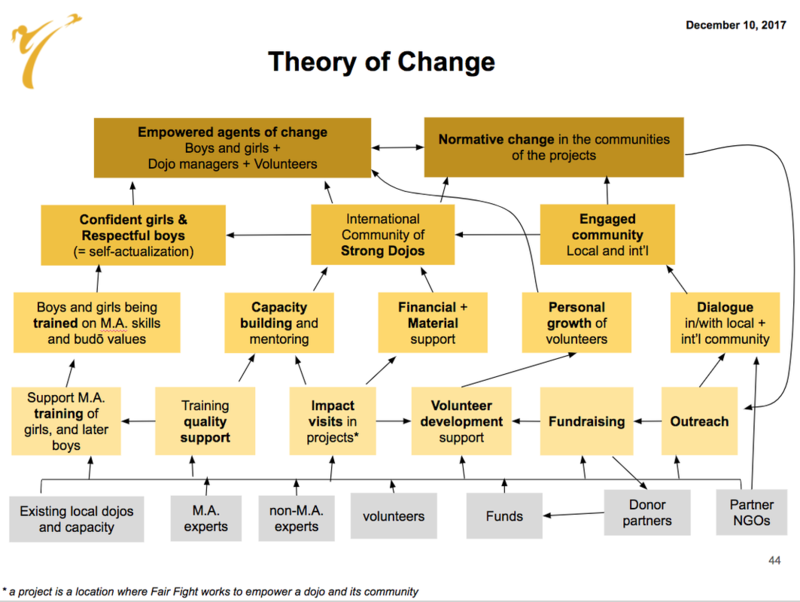 Our Theory of Change (TOC) is the roadmap that helps us figure out where we're going and how we get there, and it needs to be reviewed periodically to check how the activities of FairFight align with its vision for change. For us, this process involves "sticky notes-sessions" with our volunteers. During these sessions, we split in small groups that discuss and note down key-words regarding our current activities and objectives on the coloured post-its, as well as ideas on what is missing in our TOC schematic. 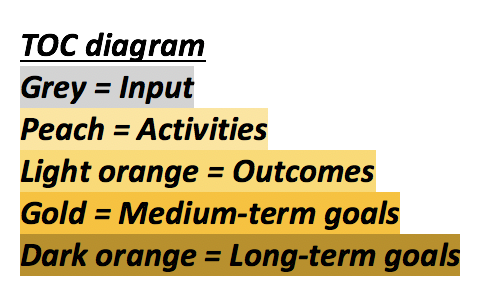 When this is done, we assign the sticky notes on the four different levels of our TOC: inputs; activities; outcomes; long-term change. We then critically discuss whether our TOC is able to fit all of the points that we raised, or whether it needs to be changed. Our last "sticky note session" took place in August during our big volunteer get-together, and it quickly became apparent that we had outgrown our current TOC, so we set about changing it. The main point that we have reconsidered is what an ambassador of change looks like. Particularly, thanks to the lessons learnt from our interaction with Tinashe, our 1st ambassador of change, we realised that martial arts (MA) training was not sufficient but that it had to be embedded within a life path, consistent with the values of Budo. Those values include improvement of the mind and gaining agency as an active member of your community. That means growing the mind through education and growing personal and professional capacity through experience, training, mentoring. FairFight cannot do these things alone. We are an organisation primarily based in Martial Arts and not an educational / vocational skills provider. Our ambition is therefore to find like-minded partners (universities, local NGO’s, local community projects…) that can help us to create this life-path for our most dedicated and committed FF students. The FairFight journey does not stop upon graduating from high school. 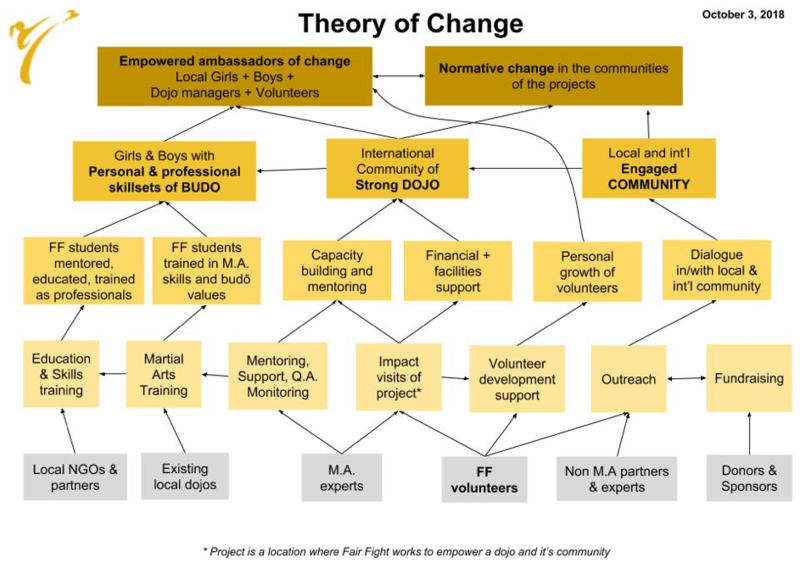 Our ambassadors of change will have the skills, the experience and the confidence to pay forward the work of FairFight in their own communities, in line with the values of Budo. In essence we consider FF students as the centre point of growth (Budo) within the MA community (Dojo) that services the broader community. All 3 are interdependent and grow with each other. ​Below you will find our reworked TOC. We have simplified, streamlined and reflected our new priorities. We are very excited to work with this new model in our upcoming projects in Zim and India this mid-October. The bottom row lists the “input” that FairFight uses in order to have active projects. The second row are the activities that resort directly from the inputs. The third row represents the outcomes of these activities. The fourth row lists our medium term goals (2-3 years). The top row represents out long-term goals of change, which are considered a success once the projects can sustain themselves without further mediation by FairFight. Heading into the second week, the team is feeling positive, motivated, fit and healthy, and ready for action. For now though, they will be enjoying a weekend of kite-flying for Makar Sankranti. Until next time, thank you for your support! 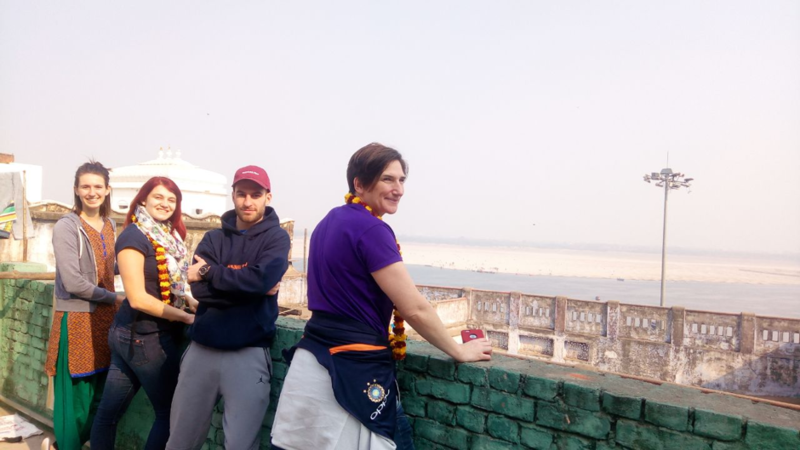 On January 4th, Floris Eland and Myrthe Minneart arrived in Varanasi, marking the kick-off of the 2018 India impact visit. They will be joined on the 8th of January by Katie Alexander and Mary Stevens from the UK. The main objectives for this impact mission were to assess the progress of the girls, reinforce our collaboration with our local partners, and help our local teachers with context-appropriate teaching tools and pedagogical training. The team has been busy getting everything ready to get the most out of our third visit to the India project site. Katie and Mary ran successful fundraising campaigns to cover the costs of their travel and provide some of the equipment and materials needed for the trip, such as new gis for our local instructors. Mary, a veteran teacher-trainer, condensed her elaborate teacher training tools into a succinct, easy-to-use manual for Sohan Kumar, Devesh Verma and the team at Dragon Martial Arts Academy. Because many of the local karateka do not speak or read English, Mary had the material translated into Hindi by her friends Rajeev and Uma Joshi, then printed and bound at very short notice and for a very generous price by Mayo Digital Printing (Abingdon, UK), who also printed a set of FairFight gis for the team. The ladies also collected donations for the girls, such as skipping ropes, stationery and sustainable menstrual products. Thanks to everybody who donated their time, services, money or items to the project! We can only do what we do because of your support! To provide a day-to-day account of the journey, the team started a blog, written by Mary and illustrated by Katie. In Mary's words: "We have a strong sense of purpose and momentum now. But still so much to do before setting off for the airport!" Floris and Myrthe were picked up at the airport by Devesh, and then finally got to meet Heifara in person in upon arrival in Assi Ghat. After a paneer dinner with Heifara, our guys collapsed for the night in their rooms at Ashish Cafe, the FairFight stronghold for the duration of the trip. The first full day was spent discussing plans and expectations with Heifara and Devesh, and we are happy to report that everything is on track! "Being back in Varanasi is very weird. Myrthe and I are still getting acclimated to the intense sensations and life in Varanasi, but we hit the ground running. As many may know the smells, noises and life in general are very different from what I'm used to, and the past 2 days have been a blurr. We made sure to meet up with our local trainer Devesh, with Heifara from the Ashadiya foundation and of course to already say hello to the girls. In preparation of the arrival of the rest of the team we're talking to all relevant parties to confirm the proposed schedule and talk about expectations, as well as making sure we have an accurate picture of what is and has been happening in Varanasi. I'm very excited, and I think I can speak for everyone to say that they are as well, and ready to give and get the most out of our time here in Varanasi!"